Once your milk tracker has been setup and had all of its accounts mapped and various settings sorted, you can move on to building your budgets and forecasts. For New Zealand dairy farmers, we automatically populate almost all milk companies with their milk prices each season (including any season adjustments). Head to your milk tracker, and using the global settings (A) select your season and budget. While you're here, you can also update your benchmarking settings for your milking platform (B). These can be changed at anytime. Once all that's done, you can start loading in your budget kgMS, milk prices, and deferred milk income (C). Your kgMS (or, production) must be entered in whole numbers under the first column titled Production kgMS. If your milk price differs from the company milk price, you can enter your own price under Your milk price. The final step is to enter your deferred season income (if applicable), once done, hit save changes. Check out this article on how the milk tracker payments are calculated. There are four main tools in your milk tracker. When in a budget view, three of these are available for use. Update deferred and Add forecast overflow are two tools that work with the prior seasons forecasts. If your last seasons forecasts are populated, you can use update deferred to bring forward the calculated deferred payments. These are accurate and based on last years actuals + forecasts kgMS and milk price differences. 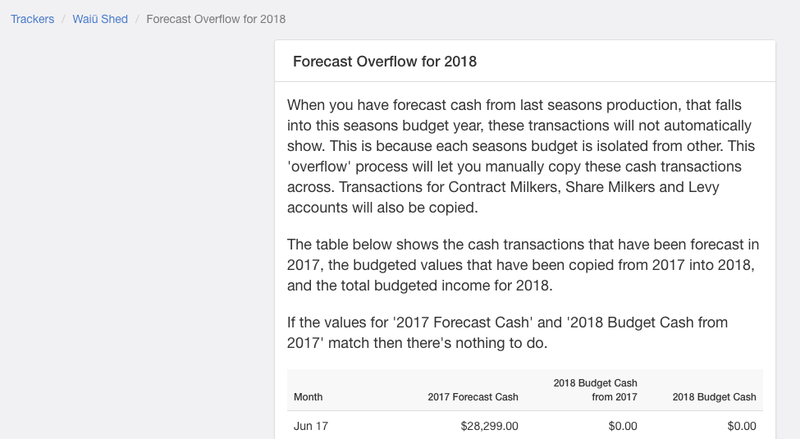 Add forecast overflow is how you will get your May paid June figures into this seasons cash budget. Check out this article on how that works. Once you've filled in last years forecasts, click Add forecast overflow which will take you to the following screen. If it all looks okay, click Copy budget to forecast. If your selected milk company has recently released a pricing update, you can use the reset milk price button to bring those up to date values into the milk tracker for you automatically. With your milk budget confirmed, you can move on to building out your forecasts. We recommend copying your budgets to your forecasts from within the milk tracker, which will instantly replicate your budget and turn these into your forecasts. One click! Deferred payments for your forecasts will come through automatically from last years forecasts, so you'll need to make sure that you have production values entered into the prior years actuals + forecasts (which you would have done to bring across your May paid June payment). Your forecasts can then be edited at anytime. All actual milk payments shown in the milk tracker from come Xero, so they are independent from the production calculations discussed above. As soon as the payment has been coded in Xero, it'll come through to your milk tracker and all further reports too. Actual production (kgMS) is entered into the milk tracker manually, but if you're a New Zealand Fonterra supplier, you have the option to enable Fonterra feeds which will automatically populate the production column monthly.